Samsung Galaxy S5 contain the possibility to display applications in Multi Window Mode and also Split Screen View, which enables you to run 2 applications together. Samsung’s Multi Window feature was originally developed for the big screen on the Galaxy Note lineup of phones, but the Galaxy S series of devices have taken on the feature as well since their screen sizes have crept larger. With a 5.1-inch display, there’s plenty of room to work with two apps at the same time if needed on the Galaxy S5, and Multi Window helps you do just that. Though not every app is supported for use with Multi Window, it’s certainly worth giving a shot if you think you can get more done with two apps on your screen at the same time. 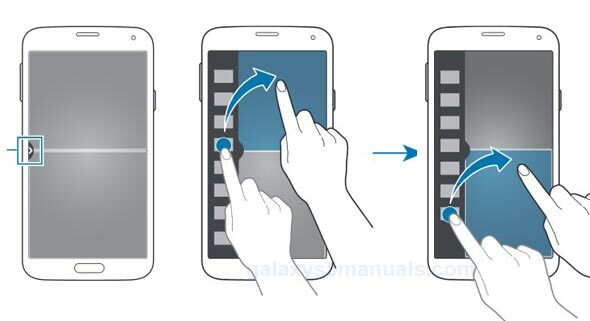 Read along and see the ins and outs of using Multi Window on the Galaxy S5. In this article, we will offer some help on how to first enable Multi Window Mode on Galaxy S5 and then how to start using these features. Once you’ve enabled Multi Window Mode and Split Screen View on Galaxy S5, make sure that you’ve a grey partially or even half circle on the watch’s screen. This particular half circle or partially circle on the Galaxy S5 screen indicates that you’ve enabled the settings and you’re prepared to begin to use the Split Screen Mode. To get started using these features, you should tap into the semicircle to bring multi-window to the top. Once you’ve done this, pull the icons from the menu to the window you’d like it to open it. An awesome feature on the Galaxy S5 is the possibility to resize the window simply by pressing and also holding the circle in the middle of the screen and placing it to the new location you want it to go.